Release Date: Was March 16, 2025 – Now Sept. 15, 2018 due to 2 pt reduction. Prison Incidents: Sleeping on lower bunk when cellmate went to the drug program – otherwise perfect conduct. Accomplishments: Mentor for 10 years Right Start Program for women; VT Computer (500 hrs), VT Building Trades (753 hrs), VT Horticulture (669), Non-residential Drug Program, Drug Education, Stress and Anxiety Management, Trauma, Domestic Violence, just to name a few. Supporters: Lori’s sentencing Judge –Honarable-Mark-Bennetts-letter supporting Lori’s clemency. 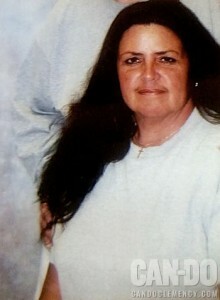 Clemency Please sign Lori’s change.org petition to garner support for her clemency. After Lori’s husband committed suicide, she eventually started dating a guy who brought drugs into her life. Long story short, when he was indicted, she was labeled as his assistant and held responsible for the totality of all his illicit actions. Lori does not claim to be completely innocent, but he introduced Lori to Meth, which prior to, she had never experimented with. Although he was far more culpable than Lori, he received less time and has been free for approximately 4 years! This is due to enhancements that were added to Lori at the sentencing phase which are no longer allowed. Moreover, the person who supplied drugs to Lori and her boyfriend cooperated for a reduction, got 14 years and has been free for some time. My husband killed himself when my sons were 3 and 4 yrs old. I was left with nothing as I was a student and working only 20 hrs a week. My judgement and actions were horribly skewed by the trauma of his suicide and my desperation to provide for my sons. I accept full responsibility for my crime and pled guilty. I know that my actions ruined my life, my sons and had a negative effect on my community. I do not, however, believe I deserved 24 years. The entire case against me was based on hearsay evidence – there were no drugs, paraphernalia, wiretaps, or any physical evidence of any kind. My greatest regret is that I have 2 sons that have grown up without me and 3 grandchildren that I have never met. I’m from NW Iowa but am serving my sentence, without hope of visitation, in Coleman, Florida. I have always had camp status, which means that even with my 24 year sentence I was sent to a facility with no fence. During my incarceration I have been involved in numerous educational and psychological programs. Both as a student and a facilitator. To name a few; VT Computer (500 hrs), VT Building Trades (753 hrs), VT Horticulture (669), Non-residential Drug Program, Drug Education, Stress and Anxiety Management, Trauma, Domestic Violence and so on. I am currently in the CDL Program and will have a Florida CDL within a month. I am the coordinator and facilitator for the “Alternatives To Violence Program.” I have tutored and mentored new women with the Right Start Program for 10 yrs. I am involved and dedicated to improving myself and my community. My Judge said that there was no-one sadder in the courtroom that day, that him (besides myself and my family) for the sentence he was forced to impose on me. He said I was a prime example of the atrocities of the sentencing laws. I am proud of the person I am today. I’m proud to be a mentor (10 yrs) in the Right Start Program, for new women. I am currently the Coordinator of the Alternative to Violence Project, in which 100’s of women are encouraged to seek peaceful solutions to conflict. I have taught numerous ACE (Adult Continuing Education Classes) and have tutored GED and ESL classes. I received my CDL from UNICOR and am enrolled in the BWIM Program (Basic Warehouse Inventory Management). That will register my job skills with the Dept of Labor. My hopes are to be involved in continuing to help the incarcerated and their transition back into society. I’d love to be able to finish my college degree. I received my CDL from UNICOR and am enrolled in the BWIM (Basic Warehouse Inventory Management Program). That will register my work skills with the Dept of Labor. I have lost everyone in my family but my sons and my grandchildren, whom I’ve never met. I need to help my sons raise their families and always be there for them. I’ve taken so much from them by not being there. My mother and sister have both passed away during my incarceration and I was not able to be there when they needed me most or to even attend their funerals. I am 57 yrs old and need to get out before I’m to old to provide for myself. I feel that I have a lot to contribute to my family, the workforce, and my community. In June of 2004, I met Lori Kavitz — a vibrant 44 year-old widowed mother from Iowa. Lori’s husband committed suicide, leaving her to fend for herself and two young boys. Lori is a first time, non-violent drug offender. She was not a drug user or abuser. She is a homespun all-American girl who lived a normal, middle-class life with not even a blemish on her driving record. Lori’s crime was to become involved with a man who sold drugs — a crime of the heart. The crime she was charged with, however, is the catch-all “conspiracy” charge. Conspiracy, like the tango, takes two. When the indictment was handed down in the Northern District of Iowa in 2001, Lori was labeled as her boyfriend’s co-defendant — an assistant for his drug transaction, and therefore equal in responsibility before the law. Although clueless about the quantity of drugs sold by her boyfriend, by law, she was held accountable for all of it. Each co-conspirator bears the weight of the entire conspiracy.